When I was looking for a recipe for spinach lasagna, Tom’s archival memory located the exact back issue from his collection in which such a recipe appeared. This one comes from the March & April 2004 issue of Cook’s Illustrated magazine. My lasagna didn’t come out looking quite so spinach-y as the picture in the magazine, but as anyone who complains about a CI recipe will ultimately reveal… I didn’t follow the recipe exactly. I changed things up a bit by making two smaller, square lasagne instead of one big 13×9. I usually do this when making lasagna as it is basically the same effort, and I get two dinners out my time instead of one. Lasagna #2 is already in the freezer waiting for the next time I don’t feel like cooking. As it says in the article, “…use Italian fontina rather than bland and rubbery Danish or American fontina…” I found Italian fontina at the Wedge and I was glad I did. I passed up the Wisconsin variety (Don’t be fooled by Bel Gioso’s name… it’s Americano.) at Rainbow for the good stuff and it smelled sooo good when I took the cheese out of the plastic wrap today. No more non-Italian fontina! Tom’s first words when coming in the door after work: “Smells like shallots!” I used to think “5 shallots” meant five of the shallot-shapes that come lumped in twos sometimes. I have known since I got some schooling from Tom a while back that 1 shallot is whatever the unit is BEFORE you take the skin off. I’m glad I know this now as my 5 large shallots that I picked out equalled exactly 1 cup—just as the recipe said they would when minced. Giving no-boil noodles a soak for 5 minutes in hot tap water makes for a WAY better end result. I used Barilla as CI suggested and did this soak that they talked about in a “Key Step” caption with photo. What a difference. As they said, “A five-minute soak… dramatically reduces the baking time for the no-boil noodles, allowing the spinach to remain fresh looking and tasting.” Try this the next time you use no boils… and don’t forget the foil on top! Freshly ground nutmeg is awesome. I was reminded of nuez moscada en croquetas as I was grating it into the béchamel with my Microplane grater. If you don’t have one of these already (I know that most of you do), you should get one. Nothing is better for ultra-fine parmesan grating, chocolate shaving, nutmeg grating, and citrus zest creation! The hardest part? Waiting the 10 minutes after it came out of the oven for it to cool before I could cut it and EAT. This entry was posted by Martha on Thursday, March 12th, 2009 at 6:53 pm and is filed under Recipes. You can subscribe to responses to this entry via RSS. Martha–that looks wonderful! And fresh nutmeg? Wow. that sounds really good. plus a good idea about soaking the noodles rather than boiling? ; i have never done that but have wondered about it often. Martha this was really good. 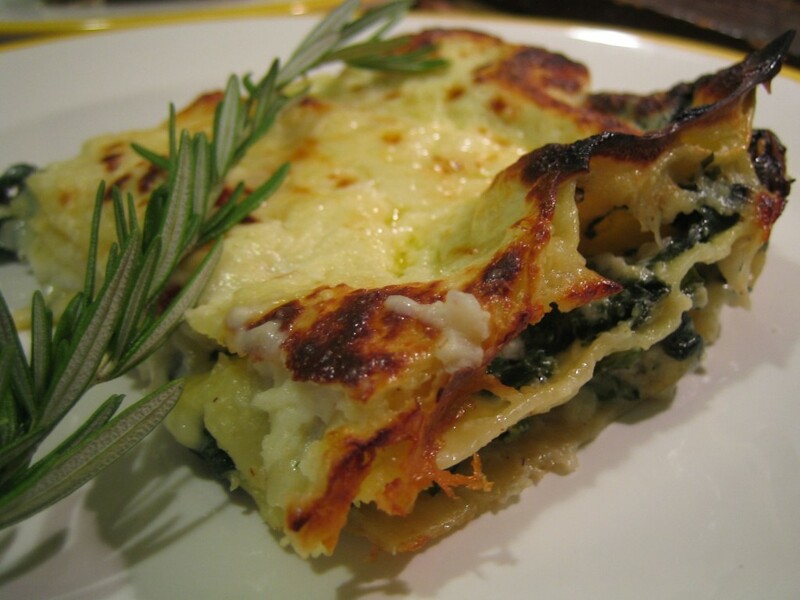 I was pretty apprehensive because I think spinach lasagna is usually awful but I really liked this. If anything I think it might benefit from more spinach—maybe use curly spinach instead of baby next time. Not that it’s easy to find adult spinach these days. Next they’ll do away with adult carrots. Also: great pictures. Thanks! I agree about more spinach. More everything, actually. When splitting lasagna recipes into two I need to remember to go a bit over on each of the layers’ ingredients. 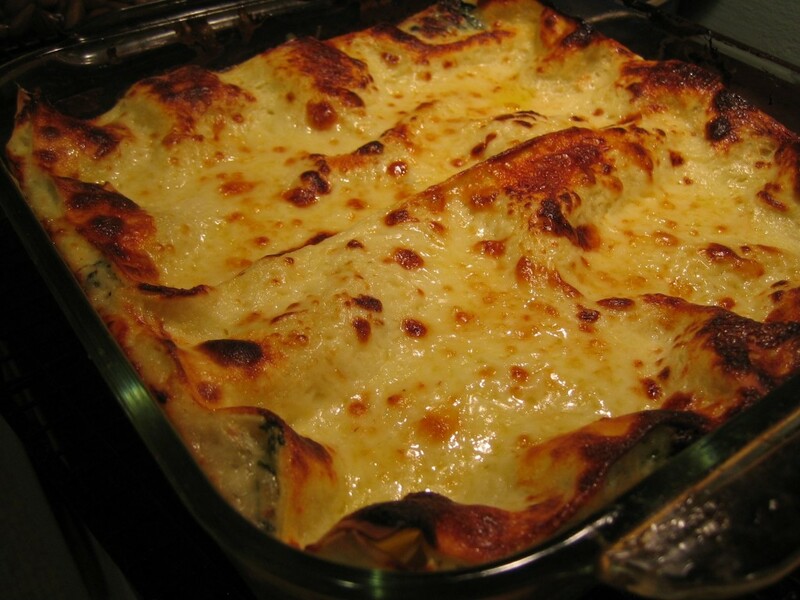 I miss the high-piled lasagna of my youth!